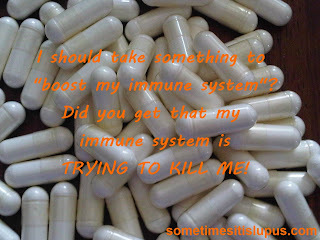 Sometimes It Is Lupus: Is It Snake Oil? Lupus patients (and people with other chronic illnesses) get so many suggestions from well-meaning people about "treatments" or even "cures" for our condition. Sometimes, it's another lupie, who has had a good experience with a change of meds, and it may well be that something similar will help us, but far more often, it's snake oil. When I hear about these things, I often check what the actual research is into the background. Often, it's something like Low Dose Naltrexone, or Stem Cell Therapy, that has shown some promising results in early research, but has a long way to go before it's actually proven whether it will be effective or not. Some will be things that had very mixed results in early testing and may actually be dangerous in some cases, such as "Cannabis cures all cancers". And there will be some, such as mixes of vitamins, etc, that will probably have no effect at all. Here are some quick ways to identify that something is more likely to be snake oil, than an actual, proven, treatment. The has a supporters' website or lobby group, talking about the "miracle" cures: Believe it or not, doctors don't need to be harassed to prescribe proven, safe, treatments. The product treats/cures a huge number of unrelated conditions: a panacea (a medication that cures absolutely everything) does not exist. Different health conditions are caused by different things, so they are cured by different things. The statement there's a "conspiracy" keeping the research proving its effectiveness a secret: science, medical or otherwise, doesn't work in secret. (The exception would be weapons research.) Research is published so it can be peer-reviewed and reproduced. Peer-review means that other researchers study the methodology to ensure there were no mistakes made. Reproduction means that the study is repeated by other researchers to check whether they get the same results or not. The statement that "there's no side-effects": any drug that does anything makes changes to the body in some way. If the drug does anything at all, it will have side-effects. Vague statements of how the product works, such as "it boosts the immune system": real science will tell you the product works on something like t-cell receptors, or increases the volume of white blood cells or something similar. It will be very specific. It's an off-label (not approved) use of the drug: unless you're taking part in a properly-supervised drug trial, you need to ask why the drug you're being offered has not been officially approved for use for this purpose. If it's approved in several other countries but not yours, that's one thing, but if it's not approved anywhere in the world, you have to wonder. Problogger is currently encouraging bloggers to write a "How To" post as part of a group writing project. If I haven't told you lately, I Love your Blog Iris!